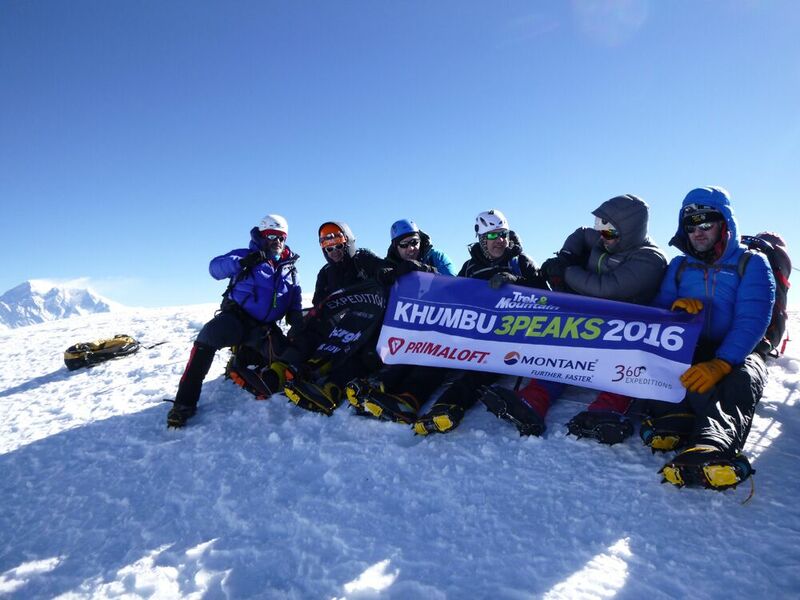 “If you do this, you can summit an 8,000 metre peak…” said Rolfe Oostra as I prepared for this mega-trip, the Khumbu 3 peaks! I’ll have to take his word for it…he’s done both…but hearing him say that kicked off some major butterflies in my stomach, it was excitement! I just knew this trip was what the word ‘challenge’ was made for. 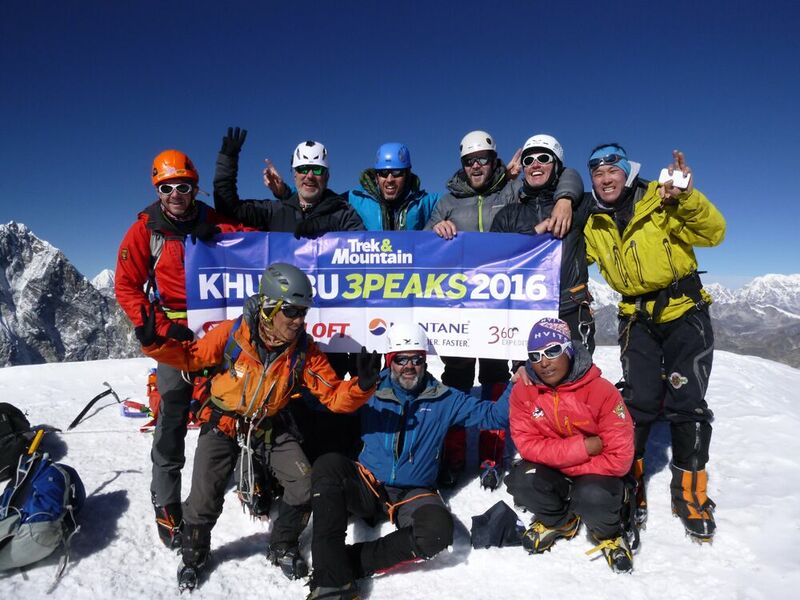 Within 24 trekking days we would climb three 6,000 metre peaks: Mera Peak 6,476m, Island Peak 6,189m and Lobuche East 6,119m. Oh…and we were approaching Mera via the Chhetra La on our third day of walking, 200m lower than Mont Blanc. And then over the Ampha Lapcha pass at 5,800m, a peak in itself on our approach to Island Peak. Let’s put that 24 days into perspective. 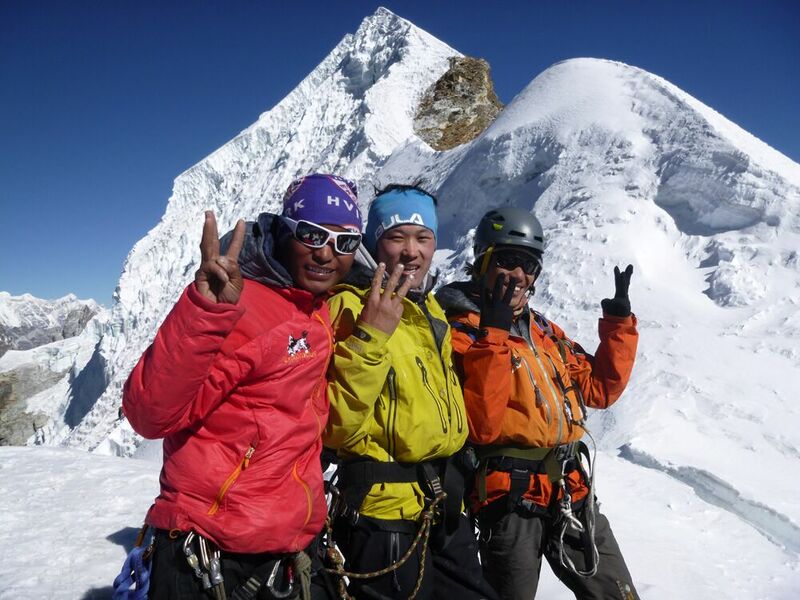 A climb to Mera Peak alone on the classic route normally takes 19 days! I was under no illusion about how tough it would be but what if we did all three? How awesome would that be? I met the team at Heathrow feeling really excited. So we made it: the pilot took off, Shona stayed open, we ate a valedictory meal at Kilroys and got to bed by midnight: ready and packed. 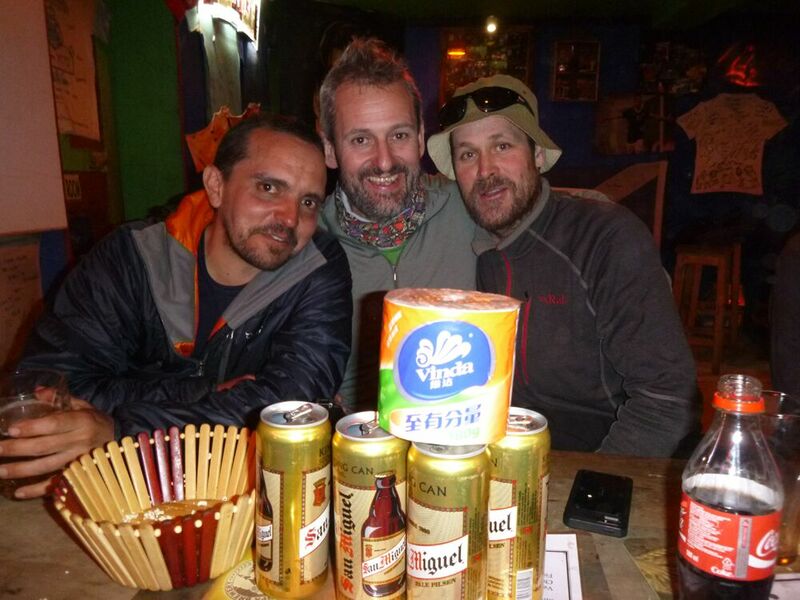 There were no flights to Lukla from Kathmandu the day before we flew and for 3 days afterwards. We had a short delay, not unusual, before we all got onto the same plane with the fabulous Sirdar Nima who I’d worked with the year before. You can see the mountains we had to cross in 3 days from the luxury of the Paradise Lodge in Lukla and the Chhetra La is visible from day 2. Do-able…well, yes it would have to be! And we did, all of us with nothing more than mild altitude sickness. Our night at Chhetra Bu at 4,400m was amazingly comfortable, except for the lack of views, and I think cemented our altitude fitness from the off. From then on AMS, a potential expedition terminator, fortunately remained mild. Outstanding! Into the Honku valley and we had our first glimpse of the mighty Mera and what a beauty!She looked savage from this angle and I reassured the group that things would soon look a bit more achievable as we got nearer. I had a bit of a personal score to settle with her – last November having set off from High Camp to the summit, we’d been beaten back by the jet stream moving south and enveloping Mera in her icy grip. Our slow approach to the summit via the Mera La and High camps gave me a glimpse of just how hard this was going to be for our porter team. Forget the size and weight of the loads for a moment and imagine crossing rocky, dirt, snowy and icy paths at crazy angles in a mix of trainers and plimsolls and not slipping, stumbling or falling. With a smile and maybe a tiny little radio blaring music to lose oneself in. Impressed? Now add in the weight, strung across your forehead so that all of the weight is transferred through your neck. Oh and if you are in the kitchen team, having cooked breakfast or lunch it’s wash up, pack up, overtake and set up the next meal, maybe even walking back down the path for an hour or so to meet us with a flask of juice. Eleven of us stood triumphant and relieved on Mera’s sunny, windless summit. What an outstanding achievement! But the clear weather showed us some glimpses of what was to come and the euphoria mellowed into a grim determination not to celebrate too early. We still had a lot to do and in not much time. We were now heading off-grid into the Hinku valley and were committed! Once beyond Chamlang Base Camp we’d be so far away from a tea house that anyone turning back would have to take one of our two cookers, a cook, tent and porter and make it back over the Mera and Chhetra La if they had any reasonable prospect of rejoining the expedition round at Lobuche. Empty apart from one small Russian expedition moving towards us having crossed the Ampha Lapcha pass, the place was stunning. The weather was with us and we at last got some spectacular views. Just wonderful. Island Peak was the next objective and we met up with Rolfe and Jo just starting on their 4 peaks challenge. Once again, when we needed it to be perfect, the weather played ball. Crystal clear, windless and quite amazing. This was a hard one! No-one who stood on the summit that day could say that it was a breeze. Lean conditions exposed hard ice, steep steps up and even narrower ridges to approach the summit. Variety was added by crossing two growling crevasses by horizontal ladders, with Ray Davies having a good hard think about plunging into the depths! 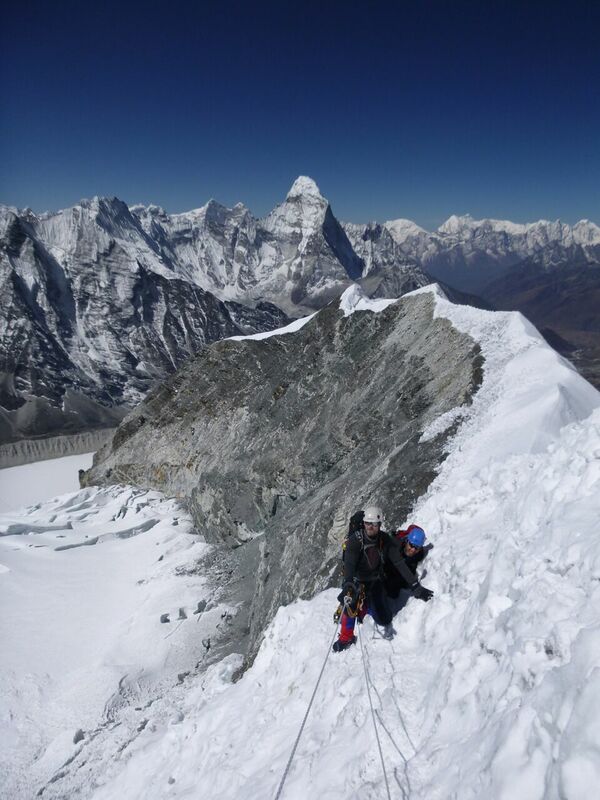 The bulk of the effort was put into jumaring up fixed ropes…good practice for Lobuche East. Congrats to Chris H, Johnny, Ray, Giles, Peter, Jamie and Dom. Apparently it would all now be much easier now as we joined the Everest Base Camp trail at Dingboche. We’d be back to camping alongside tea houses with their luxuries, a fire and goodies to buy. Who knows even a shower. It didn’t feel like it we still held on to the grim determination to get this done before congratulating ourselves. The shock of so many people so suddenly was tangible but it was back to splendid isolation for three nights as we tackled Lobuche East. 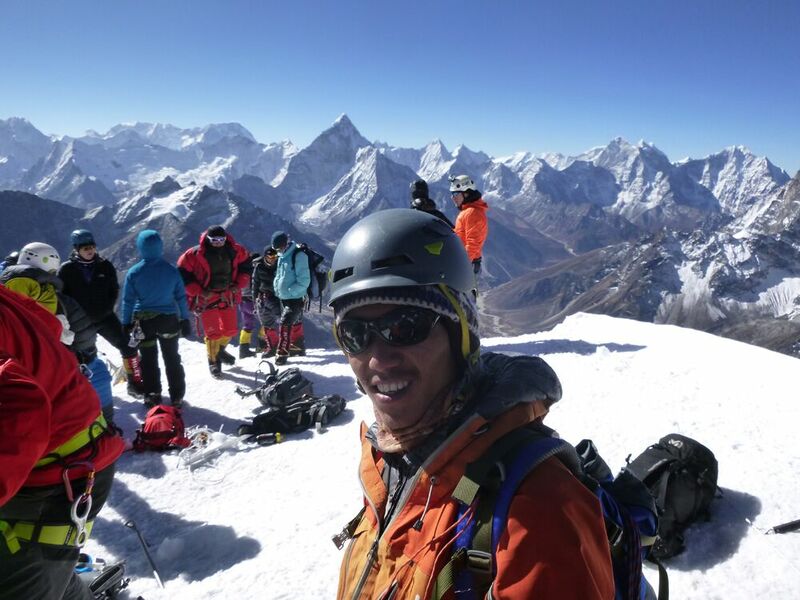 The peoples’ favourite for the most spectacular views in the Khumbu, Lobuche East soared into the sky surrounded by the most iconic of peaks. And another tough one to crack. Thumbs up to Jamie, Chris Hollyman, Chris Kempster, Giles, Peter, Johnny and Dom. Three peakers were: Chris Hollyman, Jamie, Giles, Peter, Johnny and Dom. 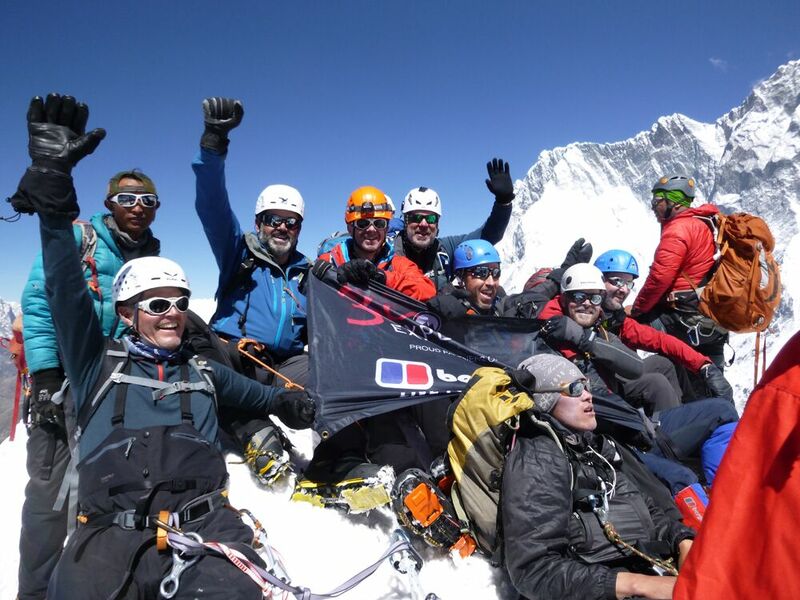 Outstanding achievement guys…outstanding…that was one helluva journey!! Three superstars without whom we would not have achieved what we did: Pemba, Kanchha and Karma! Thanks guys!